"These pecans are a standard nibble at our house during the holiday season. Pecans can be made 1 week ahead. Store in an airtight container at room temperature." Preheat oven to 250 degrees F (120 degrees C). Line a large-rimmed baking sheet with aluminum foil. Mix onion powder, garlic powder, 1 teaspoon salt, curry powder, and cayenne pepper together in a small bowl. Heat honey, butter, and remaining 1/4 teaspoon salt together in a saucepan over medium heat; stir pecans into the honey mixture. Remove saucepan from heat and add spice mixture. Toss to evenly coat pecans. Spread coated pecans in an even layer on the prepared baking sheet. Bake in the preheated oven until pecans are dry and toasted, about 40 minutes. Remove from oven and cool completely. Separate pecans. 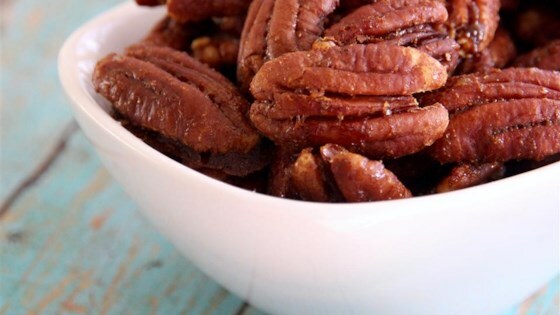 Delectable sweet, salty, and crunchy roasted pecans. This is fantastic, easy and perfect. So good. no need to tamper with this recipe!